Children do often see and sense spirit. To them, its just like seeing the living. I know this because I was one of those children. I had no idea that my first real friend, when I was aged just 3, was a little earthbound spirit girl. I was 33 before I realised while speaking with my mother about “Rebecca” that only I had been able to see and interact with her. My mother had no idea who I was talking about! But I knew which house in our close that Rebecca came from, and I remember feeling her hands at my back as she pushed me on my swing! Children are the most recent arrivals from the place we all come from and return to at the end of each earthly lifetime… Home. Little ones have not yet had cause to question what they experience. If they see a person in any energetic form, to them they just see a person. I would never encourage children to actively develop their abilities until they have reached adulthood, there’s enough for them to experience and learn. However, I have been contacted so many times over the years by concerned, sometimes very frightened parents because their little one is seeing, talking or reacting to someone they cannot see themselves and all they want to do is protect their child. 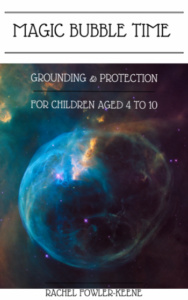 This is my tried and tested way to effortlessly help children to strengthen and protect their auric field. I have written a simple grounding and protection for you in bedtime story format for you to keep your children safe from harm. And its fun! Strengthening the aura this way helps us to keep negative energy at bay from the living too, perfect if your child is a little empath and feels everything very deeply, including the moods and energy of other people or world events. At bedtime you and your child snuggle up and relax, create the powerful “magic bubble” that keeps them safe, and invoke the protection of angels too. Its powerful stuff, delivered in a cute and simple way. and the .pdf file will be emailed to you within 24 hours.